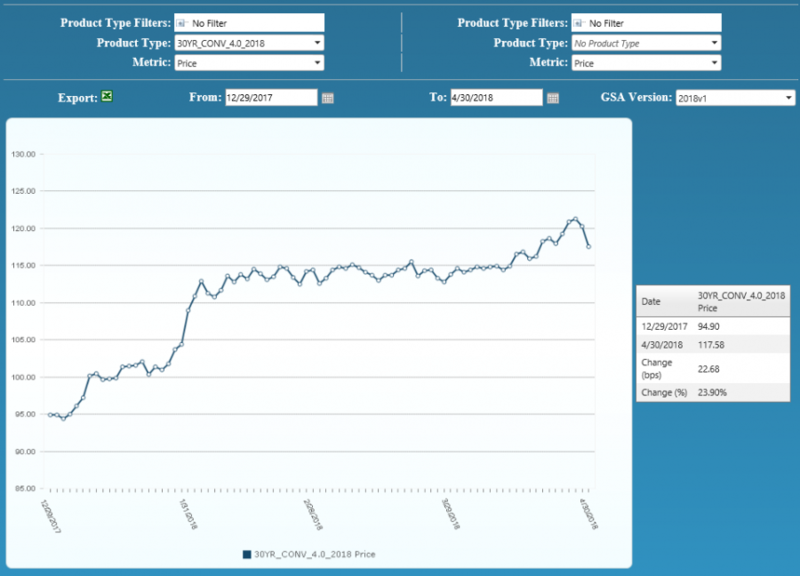 Over the last month, the MIAC GSAs™ (Generic Servicing Assets) Conv_30 Index increased by 3.53% and the GNII_FHA_30 index increased by 4.91%. In larger GSA cohorts which are actively traded in the MSR market, the Conv30_3.5_2016 and GNII_FHA30_3.5_2016 cohorts respectively increased by 3.70% and 3.91%. After a slight hiccup in March, expectations for rising rates remain firmly planted as we continue to see considerable buyer interest in the negatively durated MSRs. During the month of April Conv_30 Index OAS’s experienced a significant amount of tightening having closed the month at 634.7 bps for a reduction of 48.4 bps. Likewise, GNII_FHA_30 Index OAS’s tightened to 738.1 bps for a month-over-month reduction of 33.1 bps. In the case of Ginnie Mae, the OAS tightening partly reflects renewed optimism that prepayment rates will continue to decline relative to conventional MBS. We believe the slowdown is in direct correlation with Ginnie Mae’s ongoing efforts to address activities that result in unduly rapid prepayments. After taking a short breather in March, month-over-month Bankrate®’s primary market 30-Yr conventional mortgage rate increased by an impressive fifteen (15) basis points to end the month of April at 4.42%. Last month’s back-up means that year-to-date 30-Yr conventional primary rates are now higher by a full fifty-seven (57) basis points. As rates trend higher, further rate hikes will have an increasingly smaller impact on MSR values. When this occurs, servicers increasingly rely on earnings rates as a source for future upside in MSR value and to everyone’s delight, earnings rates did not disappoint. From end-of-month March to end-of-month April, the 5-Yr swap rate, which is a common MSR market benchmark for earnings rates, increased by nearly twenty (20) basis points to end the month at 2.90%. Likewise, year-to-date the 5-Yr swap rate is higher by a full sixty-six (66) basis points. After closing the month of April a full fifteen (15) basis points higher, the perception that primary mortgage rates will continue to rise throughout the year seems well founded. As anticipated, the U.S. Federal Reserve held rates steady following their May meeting, but on the back of rising inflation and low unemployment expectations for a June rate hike are growing increasingly stronger. The latest rate forecast by the MBA predicts that 30-Year Fixed Mortgage Rates will end the year at 4.90% and total 2018 originations will be $1.61 trillion, which based on the latest MBA forecast is roughly 6% lower than 2017 totals. With actual CPR’s on 3.5% agency coupons consistently prepaying in the 8% to 9% range it begs the question…What are the new CPR floors? In years prior, many industry experts adhered to a floor that was around 6%. In today’s environment, and due to cash out refinance activity which by itself could account for a 3% to 4% CPR an 8% floor is not an unrealistic expectation. As most know, the mortgage business is not for the faint of heart. While certain firms continue to be constrained by legal and regulatory expenses, others continue to work their way through losses on extinguishment of debt and other nonrecurring losses. Of late one’s optimism largely hinges on their ties to either the servicing or origination side of the business. Due in part to rising rates and an overall decline in defaults, servicing revenue is now moderately favorable to origination proceeds. As with virtually any rate back-up, the same number of lenders compete for fewer customers which systemically results in spread compression. 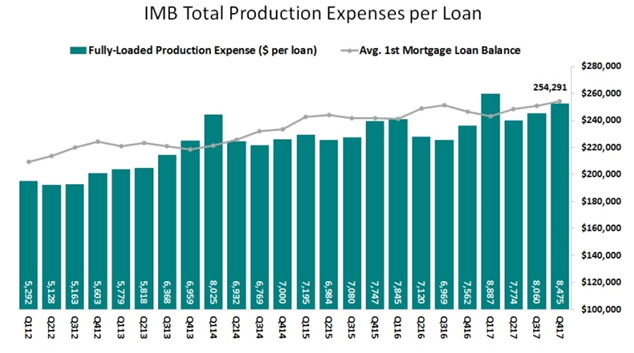 Reduced origination volume at compressed gain-on-sale margins is pushing total origination expenses higher and per loan profits lower. In 2016, Independent mortgage banks and mortgage subsidiaries of chartered banks were able to recognize an average per loan profit of $1,346. In 2017, that same figure fell to $711 thereby creating a greater reliance on MSR’s for the much-needed natural hedge. Why do I venture down this rabbit hole? For the simple reason that even a small positive or negative adjustment to servicing cost can have a profound impact on overall “net” profitability. Utilizing the Conv30_3.5_2016 GSA cohort pool at a base cost to service of $60 per annum, deviating that estimate up or down can have a significant impact on value and net profitability. For those lacking sufficient economies of scale or for those utilizing a third party subservicer, it’s entirely possible that your actual cost far exceeds those of larger servicers. Having a firm understanding your actual cost should be a critical component of any transaction related decision involving MSR’s. Comparatively speaking, after a quiet March, April and now May have been very promising for buyers and sellers alike. As numerous buyers compete for a fewer than ideal number of “large” offerings, execution levels continue to soar. In consideration of recent transactions only, we’ll define “large” offerings as deals containing $1 to $5 plus billion in UPB. Out of numerous “large” agency trades observed, execution levels for attractive collateral are now hovering in the mid to now high 4 multiple range with a smattering of 5 multiple and higher transactions. With numerous year-to-date trades having executed in mid-4 or higher multiple range, clearly, those levels are no longer the outliers but instead the new norm for larger “out-of-the-money” agency deals. April and May offerings executing at these levels contained a blend of agency product emanating from well-capitalized sellers many of whom had national footprints and MSR’s that had weighted average note rates that were as much as 75 basis points lower than prevailing primary mortgage market rates. Smaller conventional packages categorized as $500 million or less in UPB are trading at a robust pace too but at prices that “on average” range anywhere from 10 to 20 basis points lower than the bid prices obtained on larger offerings. Minus some observed outliers that fetched levels as high as a 3.9x multiple, trading levels on mostly newer “at-market Ginnie Mae offerings” continue to lag conventional agency transactions and still range in the mid to low 3 multiple range. 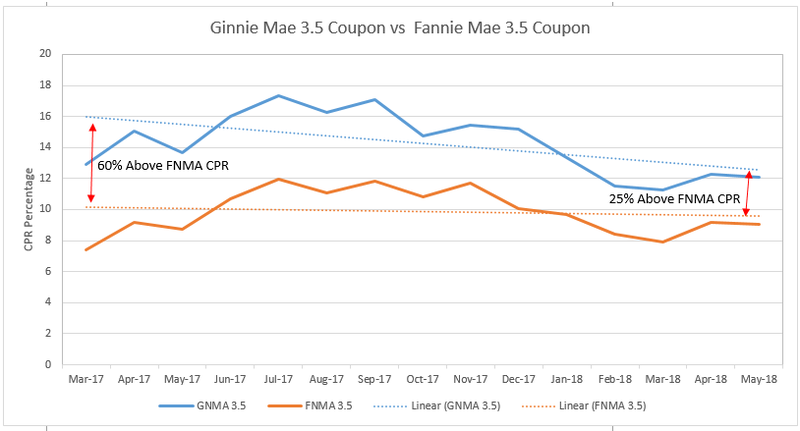 If the trend toward lower Ginnie Mae prepayments continues, we may witness increased buyer interest from those seeking improved margins at a time when competition (especially from the banks) are pushing agency values higher which in isolated instances is causing buyer yields to drop to as low as 6%. As with all transactions Ginnie Mae execution levels are heavily influenced by service fee level, geography, deal size, delinquency rates, borrower credit quality, counterparty strength, and finally, Mother Nature. Posted 24 May 18 in MSR Market Updates.